Lyonel Feininger was born to German-American violinist and composer Karl Feininger and American singer Elizabeth Feininger. He was born and grew up in New York City, but traveled to Germany at the age of 16 in 1887 to study. In 1888, he moved to Berlin and studied at the Königliche Akademie Berlin under Ernst Hancke. He continued his studies at art schools in Berlin with Karl Schlabitz, and in Paris with sculptor Filippo Colarossi. He started as a caricaturist for several magazines including Harper's Round Table, Harper's Young People, Humoristische Blätter, Lustige Blätter, Das Narrenschiff, Berliner Tageblatt and Ulk. In 1900, he met Clara Fürst, daughter of the painter Gustav Fürst. He married her in 1901, and they had two daughters. In 1905, he separated from his wife after meeting Julia Berg. He married Berg in 1908 and the couple had three boys. Feininger's career as cartoonist started in 1894. He was working for several German, French and American magazines. In February 1906, when a quarter of Chicago's population was of German descent, James Keeley, editor of The Chicago Tribune traveled to Germany to procure the services of the most popular humor artists. He recruited Feininger to illustrate two comic strips "The Kin-der-Kids" and "Wee Willie Winkie's World" for the Chicago Tribune. The strips were noted for their fey humor and graphic experimentation. He also worked as a commercial caricaturist for 20 years for various newspapers and magazines in both the United States and Germany. Later, Art Spiegelman wrote in The New York Times Book Review, that Feininger's comics have "achieved a breathtaking formal grace unsurpassed in the history of the medium." From 1909 until 1921, Feininger spent summer vacations on the island of Usedom to recover and to get new inspiration. Typical of works from this period were marine settings from the shores of the Baltic See (Ostsee). He continued to create paintings and drawings of Benz for the rest of his life, even after returning to live in the United States. A tour of the sites appearing in the works of Feininger follows a path with markers in the ground to guide visitors. He designed the cover for the Bauhaus 1919 manifesto: an expressionist woodcut 'cathedral'. He taught at the Bauhaus for several years. Among the students who attended his workshops were Ludwig Hirschfeld Mack (German/Australian (1893–1965), Hans Friedrich Grohs (German 1892 - 1981), and Margarete Koehler-Bittkow (German/American, 1898–1964). When the Nazi Party came to power in 1933, the situation became unbearable for Feininger and his wife. The Nazi Party declared his work to be "degenerate". They moved to America after his work was exhibited in the 'degenerate art' (Entartete Kunst) in 1936, but before the 1937 exhibition in Munich. He taught at Mills College before returning to New York. He was elected to the American Academy of Arts and Letters in 1955. Feininger produced a large body of photographic works between 1928 and the mid-1950s. He kept his photographic work within his circle of friends, and it was not shared with the public in his lifetime. He gave some prints away to his colleagues Walter Gropius and Alfred H. Barr Jr..
A major retrospective exhibition of Lyonel Feininger's work was put on in 2011-2012: it opened initially at the Whitney Museum of American Art, June 30 through October 16, 2011, subsequently at the Montreal Museum of Fine Arts, January 1 through May 13, 2012. The exhibition is described as "the first in Feininger’s native country in more than forty-five years, and the first ever to include the full breadth of his art" and as "accompanied by a richly illustrated monograph with a feature essay that provides a broad overview of Feininger’s career..." Many critics have argued that the artist's work was at its most mature around 1910 in works in which the power of Feininger as illustrator balance his abstract side; however, we have to consider the possibility that Feininger used cubism as a more artistically succinct tool to establish his version of the concept known as the objective correlative. At a 2001 Christie's auction in London, Feininger's painting The Green Bridge (1909) was sold for £2.42 million. At a 2017 Sotheby's auction in New York, Feininger's oil painting Fin de séance (1910) sold for $5,637,500. ^ a b c d e "Alfred Vance Churchill papers regarding Lyonel Feininger, 1888-1944". Archive of American Art Finding Aids. Smithsonian Institution. Retrieved 2011-07-29. ^ "Lyonel Feininger (Léonell Charles Feininger) is born in New York City on July 17th. He was the first child of the violinist Karl Feininger from Durlach in Baden (South West Germany) and the American singer Elizabeth Cecilia Feininger, born Lutz, who was also of German descent. " ^ a b "Lyonel Feininger". Cartoons. Ohio State University. Retrieved 2011-07-29. ^ a b c Muir, Laura and Nathan Timpano. Lyonel Feininger: Photographs 1928-1939. ^ "Deceased Members". American Academy of Arts and Letters. Archived from the original on July 26, 2011. Retrieved July 30, 2011. ^ Feininger, T. Lux (1965). Lyonel Feininger: City at the Edge of the World. Frederick A. Praeger. pp. 36–76. LCCN 65-25280. ^ "Past Exhibitions". Montreal, Quebec: The Montreal Museum of Fine Arts. Retrieved 2019-02-05. ^ "Lyonel Feininger at the Edge of the World". Whitney Museum of American Art. October 6, 2011. Retrieved 2018-02-05. ^ "Lyonel Feininger". American Symphony Orchestra. October 21, 2011. Retrieved 2018-02-05. Blackbeard, Bill (1994). The Comic Strip Art of Lyonel Feininger. Kitchen Sink Press. ISBN 0-87816-293-3. 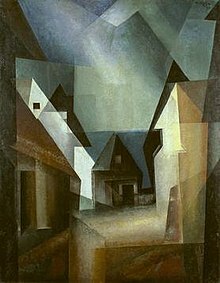 Wikimedia Commons has media related to Lyonel Feininger. Lyonel Feininger at Don Markstein's Toonopedia. Archived from the original on April 15, 2015. "Feininger-Galerie - Lyonel Feininger". Quedlinburg, Saxony-Anhalt, Germany: Feininger-Galerie. Archived from the original on 25 April 2012. Retrieved 5 November 2011.